As you can see, it's already pretty neat and tidy. We've pared down our coats and these are ones we actually use. 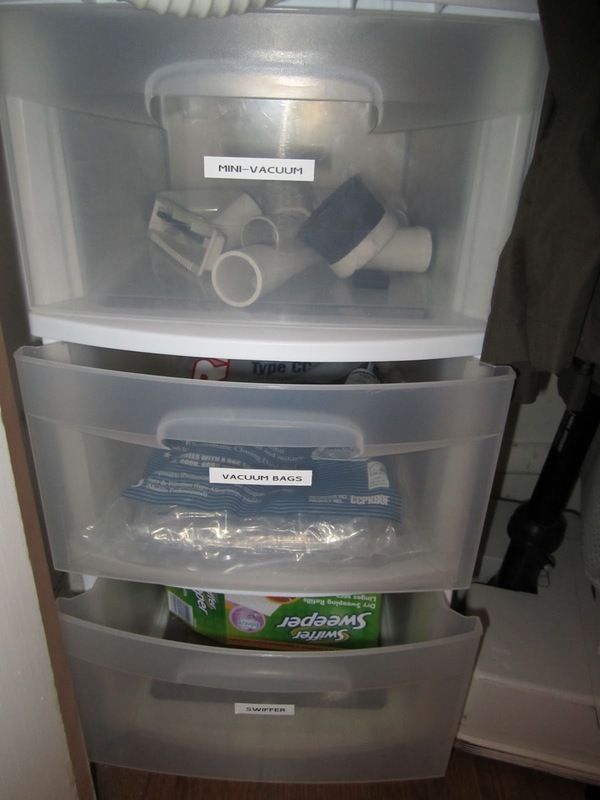 The vacuum has to live here, and the little plastic shelving unit helps keep things organized, too. I used to have the kids' boots, hats and gloves and vacuum bags in it. On the shelf above the coats are two baskets (from IKEA many many years ago), and I had more hats, gloves and scarves in one and our mini-vacuum attachments in the other. It was fine, but I knew I could do better. 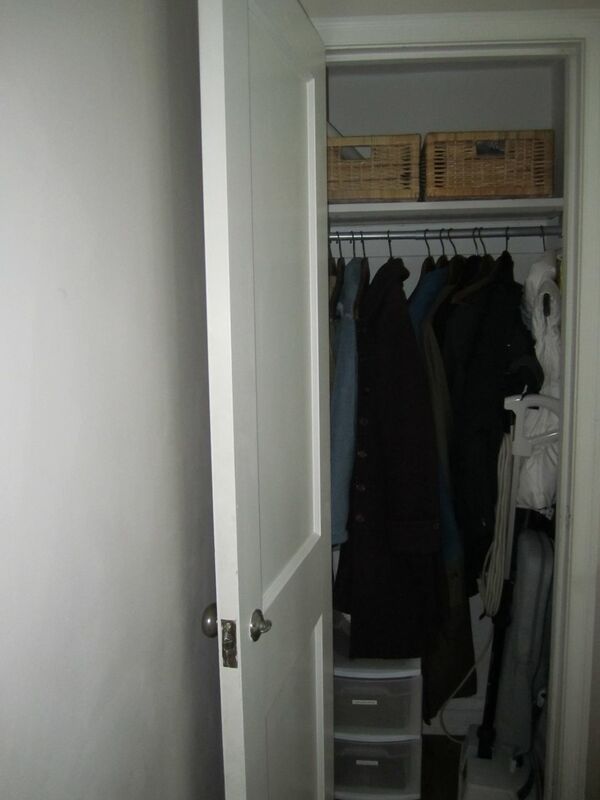 My first step was to clear out the closet. I put the coats back first and then the vacuum. Next, I decided to tackle the plastic storage unit. There are three drawers: (1) the kids' boots were a little big for the drawer (meh, that means they are getting bigger ...) so I put them in the baskets by the front door; (2) the vacuum bags stayed put; and (3) the hats and gloves moved to the IKEA basket on top of the shelf. 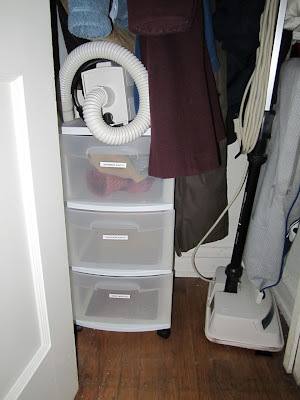 In my two now-empty drawers, I put our mini-vacuum attachments, which freed up space on the shelf up top and our Swiffer dusters and sweeper pads. Next, I went through our hats and gloves and pared down a bit. 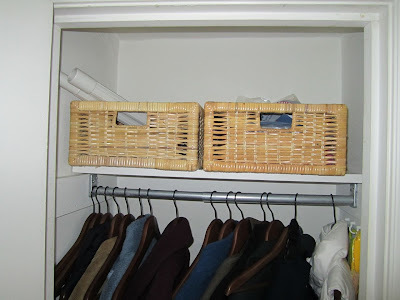 I was able to consolidate them into one of the IKEA baskets on the shelf. Since the other basket was now empty, I removed it and reused in another closet (the one in the basement!). 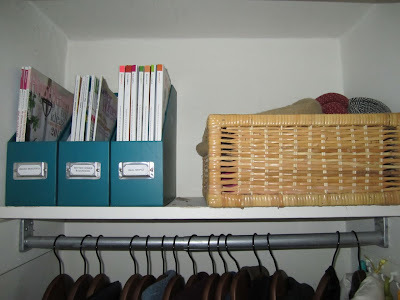 Because I am *obsessed* with magazines and refuse to throw out the ones with some great eye-candy, I decided to get some magazine holders to keep in the closet. We already have a basket for magazines in the living room, but it just isn't big enough. I found these beauties at Wal-Mart for $4 each (but I had store credit so they were free). 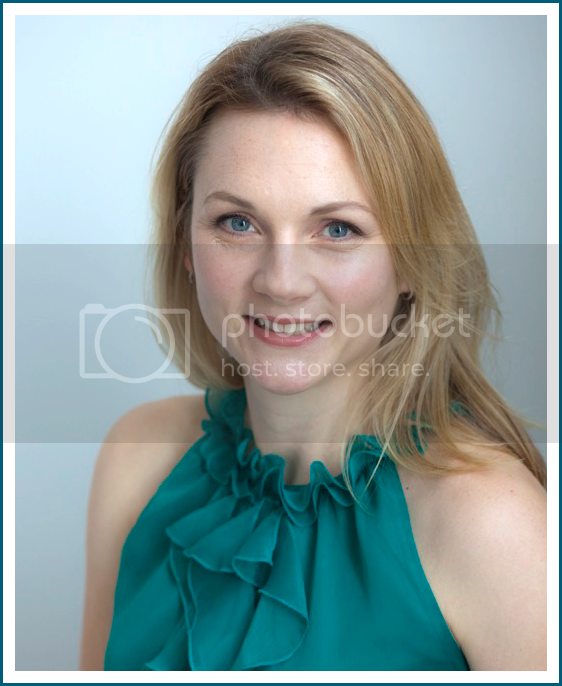 I loved the punchy teal color. I took a second to make labels for the mags on my printer. 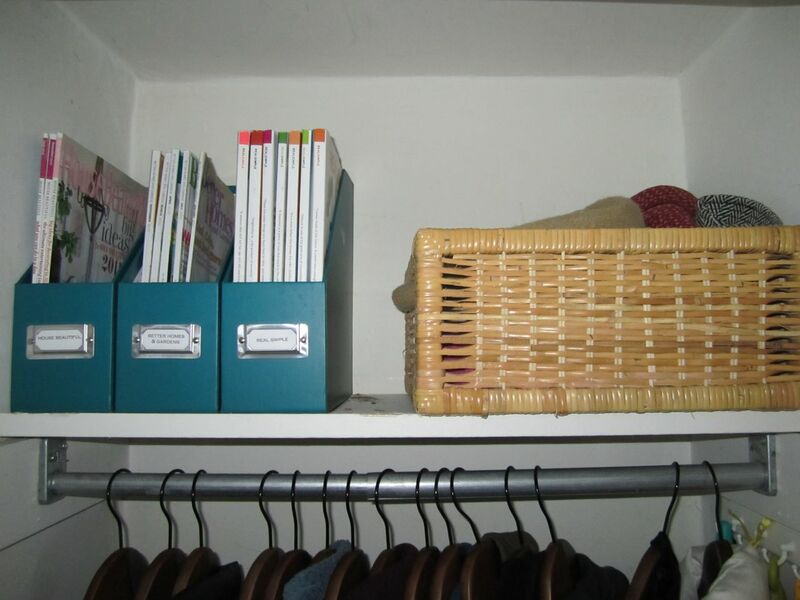 Ahhh ... now I have them organized and still within easy reach. I left the little hanging hooks for our Swiffer sweeper, dusters and my yardstick. I had put them in the closet a few years ago and they work just great. Here's a full-length "after" shot - just in case you want to see more! Ahhhhhhh. Another organizational challenge in the books! What's the state of your coat closet? Neat and lovely or kinda messy? Please share! LOVE! 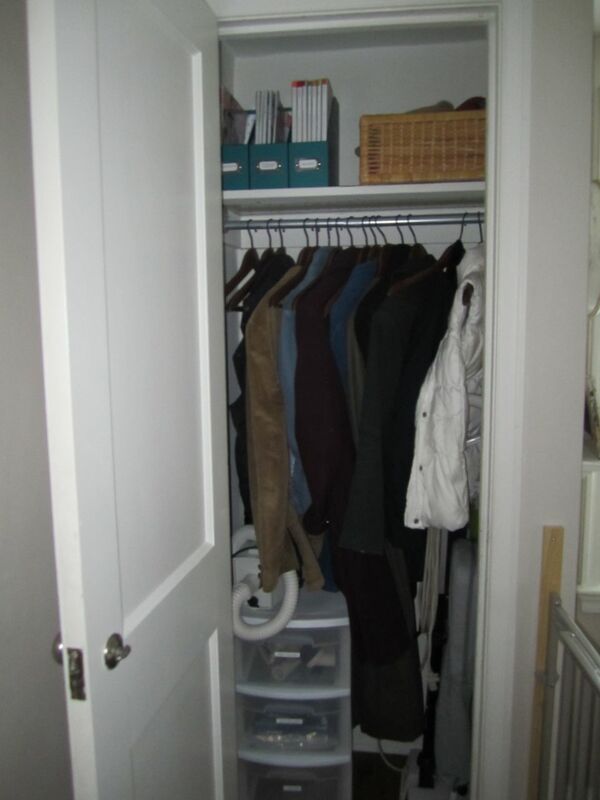 My downstairs hall closet is a mess, so I will be referring back to this post for inspiration. 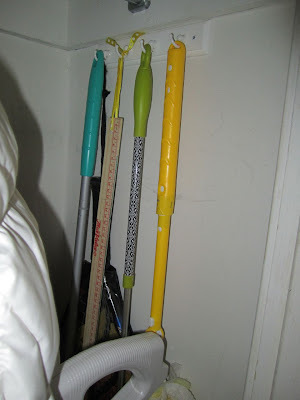 I love the hooks for your swiffer, etc. Why didn't I think of that?! I'm glad you like, Heather! It helps that we also have the shelf and bench near the front entryway. Those pieces hold a lot of our gloves, mittens, etc.